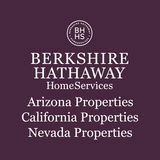 RELOCATION & REFERRAL SERVICES Whether you are buying or selling a home, moving across town or around the world, Berkshire Hathaway HomeServices Nevada Properties is your single source for Relocation help. Our Relocation Services Division has assisted thousands of home buyers and sellers with the entire relocation process. With the second largest Relocation network worldwide we make your move as seamless and convenient as possible; regardless of the location of your home. When you work with Berkshire Hathaway HomeServices Nevada Properties Relocation Services Division, we provide you with: A Personal Move Counselor This single point of contact will help you sell your home and ﬁnd another. You will be assisted with all the many details involving your move from one location to another. Home Sale Assistance We’ll help you get the best price for your home in the shortest period of time by helping you select an agent, prepare your home for sale and create a comprehensive marketing strategy. Familiarization Tours Let us acquaint you with the areas that best suit you and your family Home Search Assistance We’ll assist you with information on communities, schools, transportation, market trends, taxes and hospitals on any area to which you are considering moving. Temporary Living Assistance Assist by helping you ﬁnd convenient, affordable temporary housing. Rental Assistance We can help you ﬁnd an apartment, condominium, or single family residence. Home Beneﬁts Program Our merchant affiliation program is designed to save both time and money on goods & services for those who buy or sell a home with us! Household Good Coordination Need help with moving, estimates, packing, quality performance and employee satisfaction? Let us help! Our partnerships with major van lines ensure you have the best service and protection for your personal belongings. CrossCountry Mortgage, Inc. in Las Vegas offers a broad portfolio of home loan products to help you achieve your homeownership goals. We lend directly, meaning we’re able to offer you ﬂexibility to ﬁt your family’s needs without the red tape. Plus, with our ability to close loans in as few as 21 days (or less with our FastTrack Credit Approval program), we can ensure you spend more time enjoying your home and less time waiting for it. Call 877.245.9958 to learn about FastTrack Credit Approval. Discover the CrossCountry Mortgage, Inc. difference. All loans subject to underwriting approval. Certain restrictions apply. Call for details. CrossCountry Mortgage, Inc. is or the Federal government. Certiﬁcate of Eligibility required for VA loans. NMLS3029 (www.nmlsconsumeraccess.org). © 2018an BHH Affiliates, LLC. An independently and operated of BHH Affiliates, LLC. Berkshire HomeServices and FHA Approved Lending owned Institution and franchisee is not acting on behalf of or atHathaway the direction of HUD/FHA the Berkshire Hathaway HomeServices symbol are registered service marks of HomeServices of America, Inc.® Equal Housing Opportunity. This information, including property price, is deemedSouthwest- Residential reliable but not guaranteed. Square footage, lost size and other stated dimensions are estimated. Information not independently verified by Broker. Contact us today to see how we can serve your needs and start increasing the return on your investments. Dedicated to our craft, we have mastered a high tech, high touch approach turning each home we finance into a masterpiece. axiahomeloans.com/getstarted © 2018 BHH Affiliates, LLC. An independently owned and operated franchisee of BHH Affiliates, LLC. Berkshire Hathaway HomeServices and the Berkshire Hathaway HomeServices symbol are registered service marks of HomeServices of America, Inc.® Equal Housing Opportunity. 5,931 sqft | 5 Bed | 6 Bath | MLS#1986512 | $1,200,000 Drive up to your grand entrance encased with palm trees & lush greenery, located in ‘The Fountains’, a premier guard gated community in the heart of Green Valley. Walk into your spacious home surrounded by luxury. Custom architectural touches throughout. The kitchen is a chef’s dream just waiting for the next gathering. Stroll into your lovely private back yard tropical paradise and enjoy your pool & spa with rock waterfall. Welcome home! 3,619 sqft | 4 Bed | 3 Bath | MLS#2031239 | $700,000 Striking 1 story, custom upgraded home. Great room with ﬁreplace; oversized bedrooms & 3 full baths; gourmet kitchen with granite counters, butcher block island, walk-in pantry, S/S appliances; low-E windows & doors; resort-like master suite; and large 3 car garage. Covered patio, pool, BBQ, KOI pond. RV parking. There’s even a place for the RV. Great house for good life. 2,998 sqft | 2 Bed | 3 Bath | MLS#1978789 | $5,290,000 The most sought-after view at the most prestigious address on the Las Vegas Strip. Luxury abounds in this professionally appointed 2 bedroom plus den condo: hardwood ﬂooring, Venetian plaster, designer wall treatments, spacious gourmet kitchen, and spa-inspired baths. Experience serenity 36 ﬂoors above the glamour and glitz of the Entertainment Capital of the World while being pampered by the ﬁve diamond staff of the Waldorf Astoria. 4,107 sqft | 5 Bed | 3.5 Bath | MLS# 2006154 | $1,050,000 Gorgeous 2 Story home on DragonRidge Golf Course, hole #9. Gourmet kitchen includes marble counters, bar seating, custom cabinets with wine fridge, top of the line SS appliances and breakfast nook. Indoor and outdoor living off the family room with pocket doors, cozy ﬁreplace and surround sound. Stunning outdoor space with covered patio and basket weave tile, incredible space for entertaining. Amazing Mountain & Golf Course views! ÂŠ 2018 BHH Affiliates, LLC. An independently owned and operated franchisee of BHH Affiliates, LLC. Berkshire Hathaway HomeServices and the Berkshire Hathaway HomeServices symbol are registered service marks of HomeServices of America, Inc.ÂŽ Equal Housing Opportunity. has provided reliable home warranties for home buyers and sellers. AHS® accepts and pays more service requests than any other home warranty company in the nation, totaling $3 billion over the last 10 years. We also assist agents like you by offering a wealth of resources to help make your job easier. o s or 5 w.
LISTERPROS Real Estate Media Solutions provides top notch professional listing photography, virtual tours, post production video edits and graphic design services. We feature next day service and a 24 hour turnaround time frame on professional photos. Expand your online reach, grow your brand and business, with ListerPros. www.listerpros.com or CONTACT: Mandell Leath, mandell@ listerpros.com or CALL: (702) 675-1610. HOME THEATER / Audio and Video Premiere Audio/Video Integration has been serving the Las Vegas area since 1998. Our focus and commitment is guaranteed and delivered to every client we serve regardless of job size. Our interactive Showroom allows our customers to experience audio/video at all different levels and at all different priceranges in a comfortable, relaxed and enjoyable atmosphere. Let us help you navigate the mysteries of entertainment technology! Schedule a free consultation with one of our experts. “Big box stores are not your Best Buy”! No job is too big or too small. Call now 702877-0222 and see our website at PHEAudioVideo.com. NV Lic#0052643 HOUSECLEANING SERVICES SUPERB MAIDS, Locally-owned premier residential cleaning company, specializing in deep cleaning. We are licensed, bonded & insured. We offer topnotch customer care, easy online booking, and a 100% satisfaction guarantee! Book online at superbmaids.net or call (702) 721-8858. INDEPENDENT SENIOR LIVING REVEL NEVADA is an ALL INCLUSIVE Refined Senior Living in Brand New Apartments- Touring Now! We provide our residents with the best in customer service where luxury, restaurant style dining (overseen by celebrity chef Beau MacMillan), housekeeping, transportation, utilities, access to our spa and gym, saltwater pool, dog park and various social events are included with pricing from $2995. When active seniors want an independent, vibrant community that is second to none they move to Revel Nevada. Call today for a tour; Contact Stephanie at 702-564-6000. Or email SLowrey@revelnevada.com and visit: www.Revelnevada.com. Conveniently located off the 215 at 1525 Wigwam Parkway, Henderson, NV 89074. MOLD & ENVIRONMENTAL TESTING NEVADA MOLD TESTING, INC. provides visual mold investigation with moisture test, air sampling, swab testing, carpet sampling, and interior wall cavity testing. We offer a detailed written repor t with mold analyses, our findings, and recommendations. Testing can determine whether mold is apparent and if it is allergenic or toxic. We hold the following designations you can trust: CMI, CMA, METH INSP., CMIA,CRMI, CIAQT, & AIC. For your appointment, CONTACT: Dennis at 702-247-MOLD (6653) or www.NVMoldtesting.com MOLD REMEDIATION / WATER DAMAGE / FIRE / BIOHAZARD RAYSCO INC is your trusted source for water damage restoration services in Las Vegas. Available 24/7 and offering same day emergency services. Our immediate response team is ready and able to handle the smallest to the largest water damage & mold remediation problems. Water damage can occur in any home or office. The structure of your home or business may be compromised, and left untreated mold can appear within a very short period of time causing additional damage as well as possible health issues. YOU HAVE TRUSTED US FOR 15 YEARS, WHEN EMERGENCY SERVICES ARE REQUIRED PLEASE CALL THE RAYSO, INC TEAM! CONTACT: 702-837-4914. Visit our website: www. rayscoinc.com MOVERS ACE WORLDWIDE MOVERS Whether it’s down the street, across the country, or around the world...Ace World Wide has the people and resources to handle your relocation flawlessly. For a free, no-obligation estimate of moving costs, please call 702-454-2222 or email Josh.McSchooler@aceworldwide.com. Full Service Agents for Atlas Van Lines. US DOT# 125550 CPCN #3251 RED CARPET MOVING COMPANY is the Premier Moving Service in Las Vegas, offering all Our clients, exclusively, a 5% DISCOUNT off our already affordable rates on moving services, PLUS a 50% DISCOUNT on cargo insurance!! RED CARPET MOVERS offers complete packing, crating and moving service as well as domestic & international shipping. Our experienced handlers of your valued possessions, will provide a professional, courteous, & timely move for your residential, commercial, or industrial needs. A complete line of packing materials is available for purchase with FREE local delivery! “Don’t make a move without us!” For your FREE inhome estimate, and our exclusive “RED CARPET TREATMENT”, CONTACT: 702-920-7555. FULLY LICENSED & INSURED NV. CPCN 3339. OUTDOOR KITCHENS & LANDSCAPE MULBERRY LANDSCAPE STUDIO is your premier choice for all your landscape needs at your home or office. From designing or re-designing your new yard, to regular maintenance, or just a one-time clean-up, we are committed to providing you with the highest quality of customer service in the landscaping business, and are always available to come give you a FREE estimate for your project. If you desire the most amazing outdoor kitchen…MULBERRY is your One-Stop –Shop!!!! For your personalized Estimate & consultation, CONTACT: EDGAR 702-478-9094 or visit www.mulberryLV.com Nv Lic #84064 & 84065 PEST CONTROL ENVIRONMENTAL PEST CONTROL offers all Our clients a SPECIAL DISCOUNT off your initial fee for monthly pest control! ENVIRONMENTAL specializes in the safe & effective control of our most common desert pests, including ants, crickets, roaches, spiders, & scorpions. Satisfaction guaranteed! For your FREE ESTIMATE, CONTACT: JEFF ABBOTT 702-655-2257 or visit www.lasvegaspests.com PAINTING CONTRACTOR MARK ANTHONY PAINTING provides, expert Interior & Exterior painting, all HOA work for your residence or commercial environment. When it’s time to update your interior or exterior paint, you want to hire a painter with the experience and expertise to get the job done right. Mark Anthony Painting is licensed, bonded and insured! You can trust Mark Anthony with all your painting needs! CONTACT: Mark Anthony 702-860-3573 NV LIC #0076752 PLUMBING ACCESS SERVICES GROUP are all things plumbing, electrical and HVAC! Main sewer line inspection and repairs, whole house re-pipe, hot water heater replacement and maintenance to video sewer inspection, boilers and boiler repair, clogged drains and toilets. Serving the entire Las Vegas Valley since 2009 with competitive pricing, excellent customer service and 24/7 emergency service. Our technicians are thoroughly trained and background checked. Call ACCESS SERVICES GROUP at 702-597-1611 to schedule your appointment. NV LIC #73784, #78922, #79638 POOL CLEANING, MAINTENANCE & REPAIR CLEAN WORLD POOLS is a full-service pool company. Our highly trained technicians provide Regular Monthly Service, one-time service, equipment repair and installation, acid washes, chlorine baths, green pool cleaning, tile cleaning & bead blasting and other services. We are licensed and insured. Mention this ad, and Clients receive a 10% Discount on all one time services and repairs, AND 25% off the 2nd month when they sign up for Monthly Pool Service. Please call us at (702) 790-1900 or visit us at cleanworldpools.com. PRINTING SERVICES CREATIVE DIGITAL PRINTING helps our customers connect with their audiences and achieve their goals. Whether we’re printing complex printing projects or more straightforward ones, with Creative Digital you will always get what you need. Creative Digital Printing prints business cards, flyers, brochures, mailiers, posters, banners, vehicle wraps & so much more. One Company • Multiple Technologies• Unlimited Possibilities. Give us a call at 702-837-9009 or visit cdiprinting.com. POSTNET at Stephanie & Horizon Ridge is An Easy & Affordable Way to Print & Mail! Business Cards, postcards, Flyers, Door Hangers, Rack Cards, Invitations, Newsletters and so much more! We even offer Direct Mail Services, Sorting, Tabbing and Folding. We specialize in short runs and quick turnaround times, but also offer high-end, large quantity runs (10,000+) as well. We’ll come to you, and offer FREE citywide delivery. CONTACT TOM at 702-269-4800 and mention this ad for special pricing! PROPERTY MANAGEMENT BROWN BLANKFELD GROUP PROPERTY MANAGEMENT handles property management services for single-family residences, townhomes & condos alike. We offer the same high level of service to our property management clients as we do for our residential real estate clients. Our landlords and tenants have the ability to check their accounts with our web-based portal. Tenants can pay rent and submit work orders, while landlords can see their bills and their income at any given time. Here’s the best part: there are NO miscellaneous fees! Our motto is, “We hold our landlords to a high standard so that we may hold our tenants to a high standard.” For more information, please contact HARVEY BLANKFELD at (702) 203-1165, or visit our website at www.brownblankfeld.com. A e e d, s! We Are Your North American & Global Real Estate Leader ONE MORE REASON WE ARE HOME TO SOME OF THE MOST PRODUCTIVE SALES EXECUTIVES IN THE VALLEY WITH A HIGHER AVERAGE SALES PRICE Berkshire Hathaway Inc. is a worldwide holding company headquartered in Omaha, Neb. Its chairman and CEO is Warren Buffett, often referred to as the Oracle of Omaha and who, according to Time magazine’s 2012 ranking, is among the world’s most influential people. In March 2000, Berkshire Hathaway became the majority owner of Berkshire Hathaway Energy Company. Berkshire Hathaway Energy Company acquired a majority interest in HomeServices of America in 1998. Berkshire Hathaway employs nearly 300,000 people and owns more than 55 companies, including GEICO, Fruit of the Loom, Dairy Queen, Helzberg Diamonds, Benjamin Moore Paints, NetJets®, Burlington Northern, See’s Candies, Berkshire Hathaway Energy Company and HomeServices of America. Berkshire Hathaway HomeServices has a network of over 45,000 sales executives in 47 states and partnered with our relocation associates, have moved thousands of families both in the US and around the globe. Our key relationships and contacts internationally allow us to provide a higher level of relocation service than any of our competitors. A level of expertise you would expect with a global name such as Berkshire Hathaway. 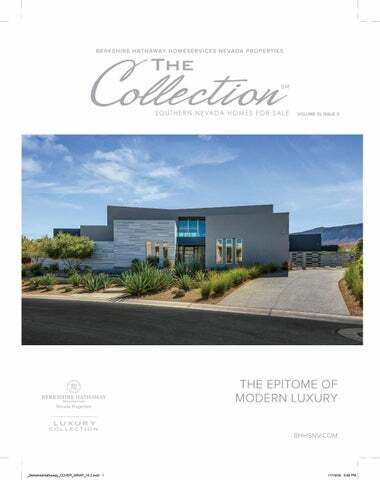 www.BHHSNV.com | www.LuxuryRealEstateInLV.com © 2018 BHH Affiliates, LLC. An independently owned and operated franchisee of BHH Affiliates, LLC. Berkshire Hathaway HomeServices and the Berkshire Hathaway HomeServices symbol are registered service marks of HomeServices of America, Inc.® Equal Housing Opportunity.